How the annual analyst “beauty pageant” vanquished The Wall Street Journal, Eliot Spitzer, and a splinter cell to reign as Wall Street’s kingmaker for 46 years — and counting. The plot to overthrow the AART. Illustration by Kevin Van Aelst. Few writers, editors, or other staffers who populate the halls of Institutional Investor’s swanky, light-kissed new offices on 43rd and Avenue of the Americas remember when the term “sell side” was verboten at II. It was considered jargon. Or that the All-America Research Team — that iconic list of the top three to seven research analysts in each industry — was definitive. Ties and scores were never revealed. Once upon a time, the contents of the AART were a state secret until the very hour that the printer’s truck rolled up to 488 Madison Ave., where a stressed-out crowd congregated in the lobby of the II offices. Before publication, the list was “eyes only” — spycraft lingo for “no pictures, no copies, and no one who doesn’t have to see it, sees it.” There were ongoing, Mission Impossible–type attempts to breach this wall of secrecy. Printers were offered bribes. (After foiling this plot, II henceforth required the printing staff to sign confidentiality agreements.) As a lowly freelance reporter, I could not oblige the Kidder Peabody analysts who would attempt to cajole the winners’ names out of me, fervently hoping to hear their own among them. II’s powerful Wall Street Letter for a period of time published the results simultaneously with the magazine. Sensing a chink in the wall, an analyst called the newsletter desk to say his mother was dying and she really, really wanted to know if he had made the list. The production-desk woman (described to me as “crusty”) who took the call instructed him tartly to tell his mother he’d been named to the first team. If she was on her deathbed, she’d never know otherwise. Things are different now. The names of winning analysts are distributed without fanfare in advance. The original football motif has left the field. No longer does a sketch artist labor over squeezing 80 heads on a fold-out cover. The Oxford comma is back! “Sell side” is not an obscenity in print. Many barbarians sought to topple the AART (and loot its audience and advertising dollars) by producing their own, purportedly superior rankings: Forbes, Fortune, The Wall Street Journal, Bloomberg Markets, and TheStreet.com among them. All have quietly folded their efforts, and returned behind the gate. Eliot Spitzer tried, and failed, to do it in too. The AART comes out every October. And it’s still good, in fact, damn good. The AART is a hallmark brand for II and analysts alike. For the former, it has long been a prescient, respected, and imitated franchise. For the latter, a place on it is a career gold star, listed on LinkedIn profiles and in obituaries. Over 46 years, it has expanded and contracted, spawned global spinoffs, and both reflected and instigated change on Wall Street. Categories and sectors have been introduced, deleted, organized, and reorganized, keeping pace with changes in finance and industry. The content has migrated from the front of the magazine to the back to the middle to online. Teamers are now photographed instead of hand sketched. 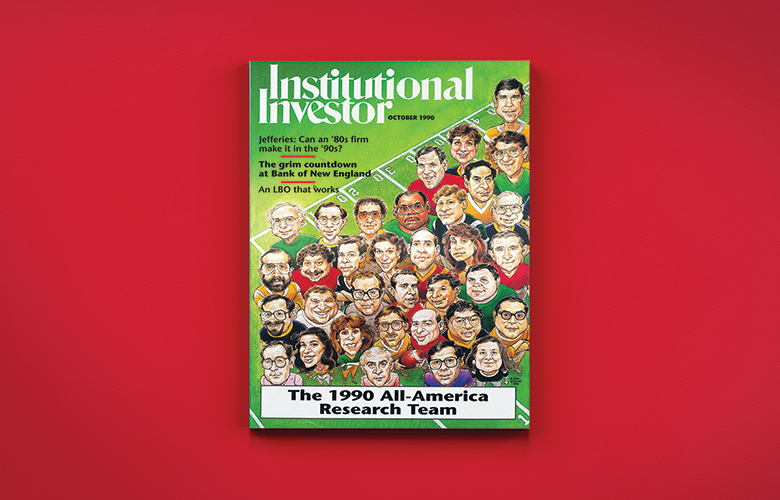 The AART has withstood seismic changes in the financial markets and business of institutional investing, as well as the ongoing crisis in editorial advertising, which for many publications proved existential. Factor in ERISA, May Day, the soporific ’70s, stagflation, the bullish ’80s, the prime at 21.5, greenmail, Boesky, Buffett, Black Monday, LBO buyouts, Brady bonds, Bartiromo, irrational exuberance, LTCM, hedge funds, the euro, the crises (S&L, HLT, Asian), Y2K, Reg FD, dot.bomb, 9/11, Enron, Sarbox, Spitzer, Stewart, subprime, recession, Lehman’s demise, bailouts, TARP, Dodd-Frank, Occupy Wall Street, Brexit, MiFID II . . . .
Last year’s AART story waxed poetic about the resilience of the sell side. This year let’s talk about the resilience of the All-America Research Team. In the summer of 1972,II founding father, publisher, and Editor-in-Chief Gilbert Kaplan tasked editors Peter Landau and Wayne Welch with creating an analyst-centric article for the October issue. They repaired to a nearby watering hole to cook up an idea (a tradition II editors continue to uphold). It was the day, or the week, or the general season of the 1972 Major League Baseball All-Star Game and somehow (a few beers may have helped) the notion of an all-star analyst team arose. The team members could wear uniforms, just like a team! Since baseball season wraps up around October, Landau and Welch lit on football. Wall Street analysts for an all-star scrimmage would be funny, perhaps a one-off. The 1972 All-America Research Team singled out 85 analysts covering 26 industries. Twenty-five of the 26 first-teamers were male. The lone female, Radcliffe-educated Joan Farr of Oppenheimer & Co., covered — you guessed it — cosmetics. The group graced the cover, bedecked in football uniforms sporting the names of their respective firms. Contrary to popular myth, Kaplan, Landau, and Welch did not handpick these analysts. From the start, the madness had a method. An introductory article laid out the methodology, and a caveat. 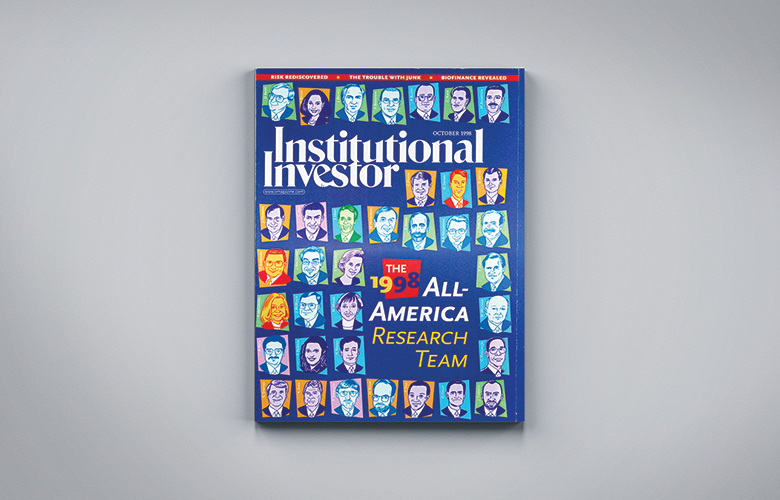 “Picking an all-American team, as Institutional Investor does for the brokerage research business in this issue, is at best a risky proposition,” Kaplan wrote. II solicited money managers for names of analysts they felt served them best. Follow-up reporting probed and validated the collated results. That’s it. This still suffices as a précis for today’s methodology. Kaplan put up the best defense against potential critics by mounting a compelling offense. He openly acknowledged bias played into the methodology. Money managers have a natural affinity for analysts who help them make money, and will name them when asked. It will matter who is asked at which institution. Vicissitudes of financial markets also affect the outcomes. Hot sectors make for hot analysts. But so what? Many a competitor thought it could dethrone II as king of the analyst-ranking kingdom and capture its booty of readership and advertising. They all failed. These knock-off rankings began appearing astonishingly late in the game. They bought, or begged for, third-party data from providers such as First Call, StarMine, Zacks, and I/B/E/S, from which they concocted voodoo algorithms of stock picks and/or earnings estimates purporting to reveal the best analysts, or, presaging BuzzFeed, just made it up. Consider the “first annual lineup of heavy-hitter Wall Street analysts — plus, their home-run stock picks,” introduced in Fortune in 2000. The methodology unabashedly admits to a “blend of science and well-placed sourcing.” In other words, they did the obligatory number crunching and reportage, then held a beauty contest to pick the winners anyway. A private beauty contest. “Finally, it came down to a panel of Fortune editors and writers to pick the team,” the methodology, as much as it can be called that, states. The project caused a splash in its 2002 incarnation, showcasing then-Sanford C. Bernstein chair, CEO, and blonde looker Sallie Krawcheck on the cover under the headline, “In Search of the Last Honest Analyst.” Fortune killed the series in 2004. Did they make any money off of it, at least? Yes, an insider says — in reprints. 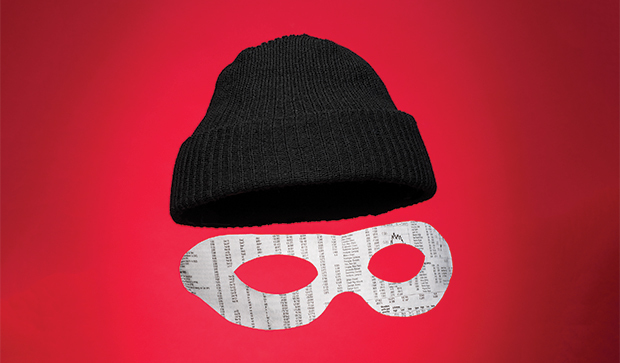 Special print runs, or reprints, are a lucrative means of leveraging published content. Companies and certain personalities buy them for advertising and marketing, direct mail, handing out at trade shows, and/or general chest thumping. 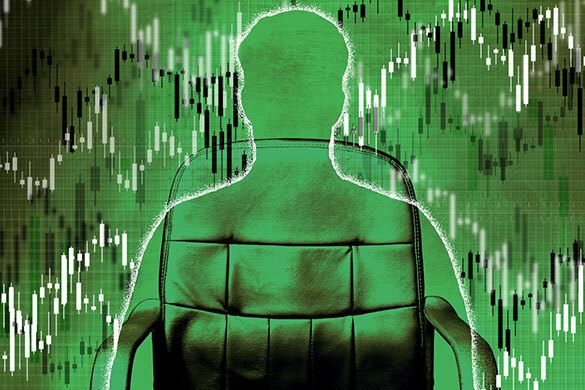 Forbes and the Financial Times have likewise published lists of the “best” sell-side analysts. May they rest in peace. 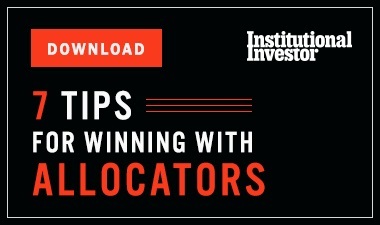 Thomson Reuters still does, online, offering the names of the year’s best estimators and stock pickers. Just the names. The firm doesn’t have to pay for data crunching, either. It owns I/B/E/S and StarMine. The Wall Street Journal rolled out its contender in 1993. Initially named with all the creativity of a store-brand soda — Dr. Skipper, Mountain Breeze, et al. — “All-Star Analysts” was rechristened “Best on the Street” in 1998. A new name didn’t save it. The methodology included a byzantine exposition on analyst eligibility, eligible companies, performance measurement, and data collection. An outside company, FactSet Research Systems, provided the data. Still, the Journal may have gotten a few laughs, if not the last, according to former II publisher David Wachtel. “The firms spent a ton of money celebrating their [II] rankings wins in ads placed in the Journal,” he recalls ruefully. Competition also emerged within II’s own ranks. For nearly two decades, the group that created the All-America Research Team was a world unto itself, overseen by spreadsheet-addicted editor Laurie Meisler, who took on the assignment in 1980 after four years cycling through various editorial positions at II. Under her watch the rankings group introduced vertical and horizontal spinoffs, starting in 1985 with an All-U.K. Research Team (clad, of course, in cricket whites) that folded into the All-Europe Research Team, followed by teams for Latin America (1992), Japan (1993), and Asia ex-Japan (also in 1993). The All-America Fixed Income Team began in 1991. Meisler was a relentless workaholic, checking and double-checking the ballots and numbers. Analysts and research directors wooed Meisler day and night, inviting her into their lions’ dens for “discussions.” After one friendly chitchat, she was told arrangements could be made to admit her daughters into Yale. At the time, the girls were three and seven years old. She recalls being badgered at another firm to add a sector, and not giving in. A fire alarm went off and everyone stood up and ran out, leaving her alone in the conference room. “Clearly they felt they were getting nowhere with me and didn’t care if I burned up,” Meisler observes. Within months of the release of the first Analyst Rankings report, Meisler and her team vamoosed from TheStreet.com. In spite of boss Jim Cramer’s enthused endorsement of “Our Rockin’ Analyst Rankings,” it wasn’t clear to TheStreet.com management how this operation was going to make money — or if it would. So that was it for the AART’s would-be usurper, the coup d’état that coup d’couldn’t. The ranking had been touted in a press release a year earlier as being “more accurate, fairer, and [having] even more impact.” More impact than what? The AART, of course. Detractors of the All-America Research Team have for four-and-a-half decades voiced two major gripes. “It’s a beauty contest,” they say. Well, yes, it is. A beauty contest with 4,312 judges who manage $11.9 trillion in U.S. equities. Secondly, “It’s gameable.” This is also partly true. Analysts quickly realized the benefit of paying attention to their clients. Was this a deceptive practice or an amplification of their job descriptions? New York magazine’s Tobias complained that “mindful that questionnaires will be sent out in June, [analysts would] schedule road trips and major research for the month or two before, to be fresh in the minds of their clients.” Gaming the ranking evolved into a high-stakes game of creativity and endurance. Analysts and research directors refined techniques they thought might sway votes. They pressed clients to write letters to II editors insisting on the worthiness of new categories where they might score higher, or pointing out the uselessness of ones that cut into their scores. Specialists were hired to help firms gain entry into, stay in, or move up in the AART. “Ran the Institutional Investor campaign moving the firm from No. 12 to No. 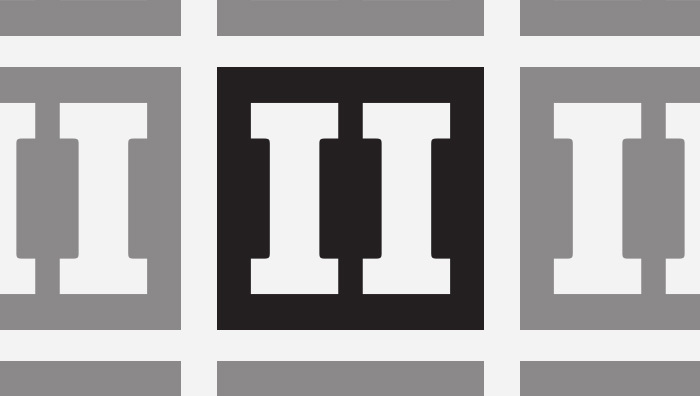 2,” boasts the LinkedIn profile of a former Bear Stearns research wrangler. Contenders stepped up their travel schedules not just before, but during the voting period. Then they pestered the rankings editors to find out when the polls closed so they could go home. “There’s a reason these folks are called sell-side analysts,” a former AART editor says. Others rose to the exercise. Helane Becker, an airline analyst with Prudential-Bache Securities at the time, was a ruthless competitor who racked up points scoring little tactical wins. In the pre-cellphone days (remember those? ), she attended a company meeting at a hotel where management disclosed something sure to produce a big move in one of her stocks. She rushed out of the meeting, commandeered the only payphone in sight, called in the alert, and then yanked the receiver fully out of the wall, handicapping her competition. Reached in Europe, Becker, today a Cowen & Co. managing director, neither confirms nor denies that she took home a trophy of that day: The receiver. 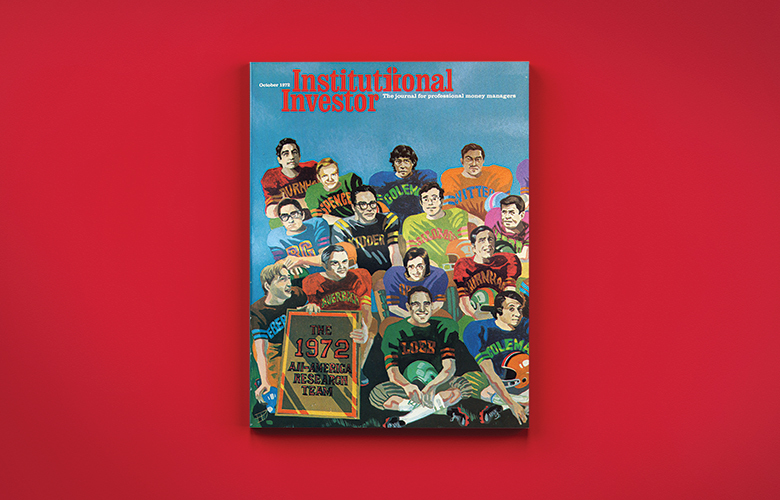 Mary Lowengard joined Institutional Investor as a contributing editor in 1990 and stuck around until 2005 or so, although her name remained on the masthead as late as 2010. She helped produce numerous rankings, including the AART, the All-Europe Research Team, the Best of the Buy Side, and Home-Run Hitters (which lauded analysts who made the best stock calls of the year).